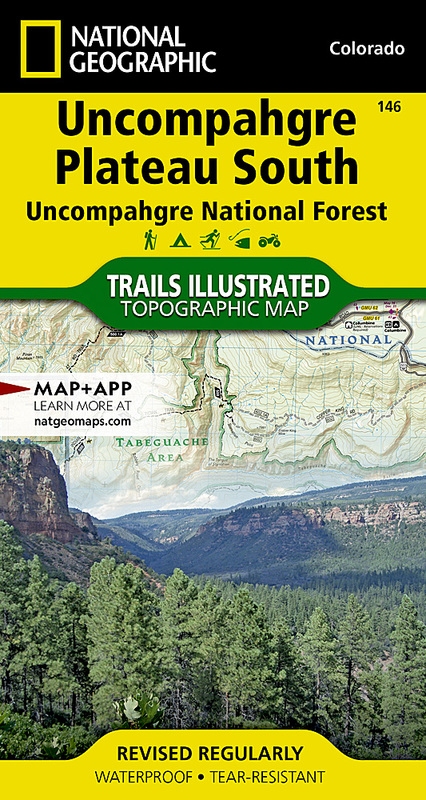 National Geographic's Trails Illustrated map of Uncompahgre Plateau South is created for outdoor enthusiasts exploring the year-round recreational opportunities in this unique area in southwestern Colorado. Expertly researched and created in cooperation with the U.S. Forest Service, Bureau of Land Management and others, the map provides unparalleled detail of southern Uncompahgre National Forest and River, Tabeguache and Roubideau Areas, Naturia Canyon, Wrights Mesa, Dan Noble and Dry Creek Basin State Wildlife Areas, San Miguel River and Canyon, Ridgway State Park and Tabeguache Trail. Use the mapped trails, OHV routes and Forest Service roads to get off the beaten path and back on again while exploring the area's mesa and canyons. Trails are labeled according to their designated usage, whether exploring on foot, skis, horseback, mountain bike, motorcycle or ATV, including rock crawling trails. Additionally, both the Unaweep-Tabeguache and San Juan Skyway Scenic Byways are marked. Seasonal roads and trails are labeled with their accessible dates. To aid in your navigation of the area, the map displays contour lines, elevations, labeled mesas, peaks and summits, water features, selected waypoints and clear color-coded boundaries between different land management agencies. Recreation activities pinpointed include areas for camping, fishing, swimming,white water access and wildlife viewing. Other features found on this map include: Dry Creek Basin, Log Hill Mesa, Montrose, Mount Sneffels Wilderness, Uncompahgre National Forest, Uncompahgre Plateau.